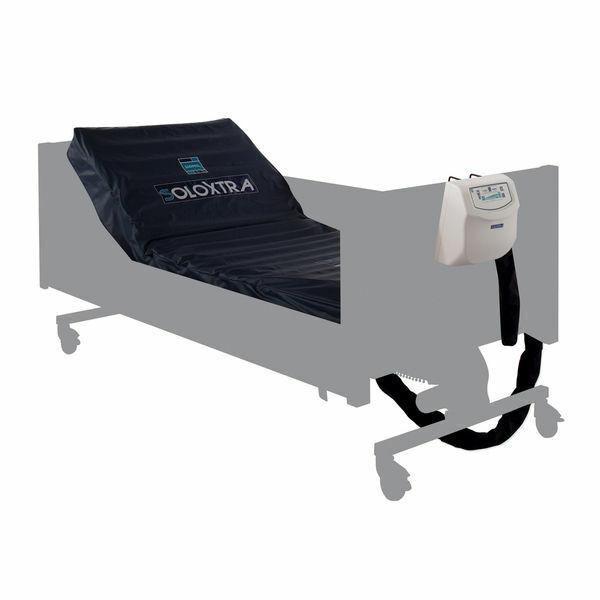 For bedbound patients, there may be a significant risk of pressure sore development if the proper pressure relief system isn't used. The Sidhil SoloXtra Dynamic Mattress System provides this with a two-cell alternating dynamic pressure therapy system for pressure relief while the visco foam underlay helps to provide optimum comfort for the user. Designed with 18 cells including static head cells for added stability and support, this mattress is suitable for patients at medium to high risk of bedsore development. This advanced mattress uses 18 cells, with a two cell alternating dynamic pressure system on 12 minute cycles. This system allows the mattress to provide excellent dynamic pressure care, while static head cells provide added stability and relief. Please be advised that the Sidhil SoloXtra Pressure Relief Alternating Air Mattress System with Visco Foam Underlay is usually delivered within 1 week of your order being placed. We would advise you to consider this delivery estimation before placing your order. For more information, please contact our Customer Care Team at 020 7501 0592.